When a motorcycle driver is injured in a Florida motor vehicle accident, the resulting injuries can be severe and debilitating. Over 80,000 accidents involving motorcycles occur each year, according to the National Highway Traffic Safety Administration (NHTSA), with Florida leading the nation in motorcycle accident fatalities as of 2016. Insurance companies use these statistics to characterize motorcycle drivers as reckless and dangerous; however, the majority of accidents are caused by another motorist’s negligence. At the Shiner Law Group, we commonly refute unfounded misconceptions promulgated by the insurance industry and aggressively advocate for motorcycle accident victims to secure the financial relief they deserve. If you or your loved one has been injured in a Florida motorcycle accident, contact our experienced Pembroke Pines motorcycle accident lawyers to discuss your legal rights and options in a free consultation, as you may be entitled to financial recovery. A motorcycle’s comparatively limited safety features exacerbate the risk of bodily injury for riders. In 2000, Florida repealed its helmet law that required drivers and passengers over the age of 21 to wear a helmet, despite data from the Department of Transportation showing helmets are 67% effective in preventing traumatic brain injuries (TBIs). If a motorcycle accident victim was not wearing a helmet, insurance companies will argue the claimant was comparatively negligible per the state’s negligence standard, even if the claimant operated within the confines of the law. Unlike car accidents, motorcycle accident victims do not need to show that a legal duty of care was owed, but rather demonstrate the defendant’s traffic safety law violation directly caused the sustained injuries. The statute of limitations for pursuing a personal injury claim against an at-fault party is four years in the state of Florida, or two years in cases of wrongful death, which makes securing the legal representation of an experienced Pembroke Pines motorcycle accident lawyer crucial to maximizing a personal injury claim’s financial recovery potential. Distracted or otherwise impaired driving. Aggressive driving, such as speeding, tailgating, or improper lane changes. Unsafe road conditions, including severe weather, cracked or uneven pavement, and construction. 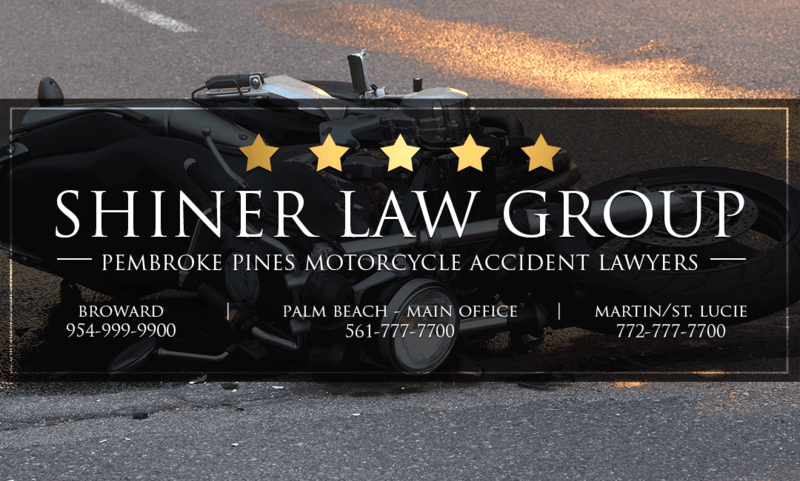 With over 15 years’ experience representing thousands of victims and their families in Pembroke Pines, our award-winning motorcycle accident lawyers at the Shiner Law Group have a results-driven approach to obtaining substantial and favorable results for our clients, who are fighting to recover from their ordeal. We provide motorcycle accident victims with the legal resources to build the strongest and most compelling personal injury claim. Our trial lawyers conduct a thorough and independent investigation of the facts, evaluate the crash site, consult a network of accident reconstructions, and facilitate insurance negotiations to safeguard your legal and financial interests. While we make every effort to negotiate a fair settlement outside of court to avoid costly litigation fees and an extensive claims process, we are nevertheless prepared to take large national insurance chains and their policyholders to trial to help you secure the financial relief you need to get your life back. Have you or someone you love been injured because of the negligent, reckless, or intentional conduct of another? Call us at (954) 999-9900 or contact us online for a free case review. The Shiner Law Group represents personal injury and wrongful death victims in Pembroke Pines and the surrounding counties.